Take 1-2 cups of chocolate chips and about 1 tsp of coconut oil and combine into a microwavable dish. Microwave and stir until chocolate is melted into a smooth texture. Wash your strawberries but dry them off before dipping into the chocolate! Prepare a pan with parchment paper on it to lay out the strawberries after they’ve been dipped. Dip your strawberries as deep into the chocolate as you’d like and then lay them on your parchment paper. 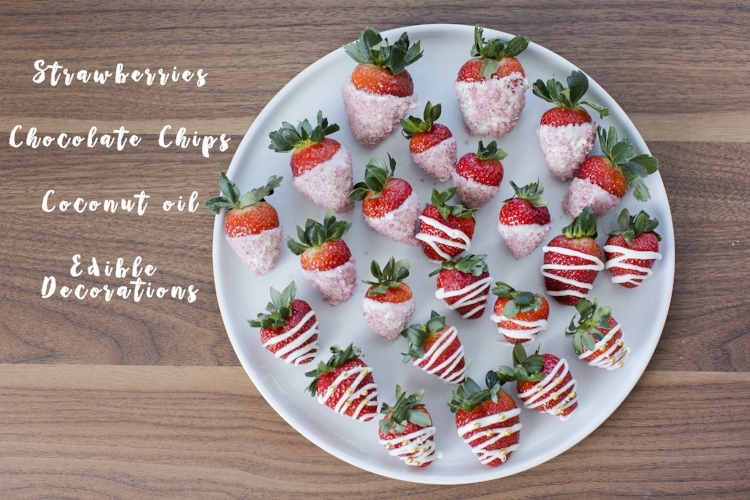 Add you edible decorations as soon as you can after you dip your strawberry. If you don’t want to dip and you’d rather drizzle it on, melt your chocolate and then take a sandwich sized plastic bag, pour your chocolate into the bag and snip a tiny bit of one of the corners off, to create your funnel. Then you’re ready to drizzle your strawberries! After you’ve covered all your strawberries, place the tray in your fridge or freezer for 5 mins, to make sure your chocolate hardens.